O'Flynn Cash Grocery opened in January of 1914 in Copper Cliff, Ontario. It is not known if the store had an actual physical location on Poplar Street, if it occupied a section of McKinnon's General Store, or if it was a catalogue store with a mailing address of Poplar Street. The ordering procedures mentioned in the store's price list, however, suggest that it was a catalogue store. Miss Rose O'Flynn was the proprietor of the 'cash only' store, which was a novelty in Copper Cliff due to the exclusive use of credit in that area. The experimental store had a short life, closing sometime before the start of 1915, though the exact date is unknown. Rose O'Flynn was born Mary Rosetta Flynn (sometimes written as O'Flynn) on April 5, 1890 in Ensley Township, Newaygo, Michigan to James Joseph Flynn and Mary Ellen Flynn (née Mary Ellen Wolfe). Her parents were born and married in Ontario, but immigrated to the United States of America in 1881 or 1882. Rose O'Flynn lived with her family in Michigan until 1907, at which time she went to live in Copper Cliff with her mother's sister, Hester McKinnon (née Hester Ann Wolfe) and her family. Hester McKinnon was married to John Romantions McKinnon who owned and operated a department store, J.R. McKinnon & Sons. Rose O'Flynn worked as a saleslady there and lived with the McKinnon's until her marriage to Gregory Lee on June 8, 1915. Her wedding day was a simple affair, with the only guests being close friends and relatives of the bride and groom. Rose O'Flynn's cousin, Richard McKinnon, walked her down the aisle. After a honeymoon in Cornwall, Ontario; Boston, Massachusetts, and New York, New York the couple returned home to Copper Cliff. Rose O'Flynn Lee was a homemaker and took care of the couple's four children, three girls and a boy. She was also deeply involved with her church, St. Stanislaus Roman Catholic Church, and was a member of the Catholic Women's League and the Altar Society. Rose O'Flynn Lee died June 3, 1950 at the age of 60 in her home in Copper Cliff. 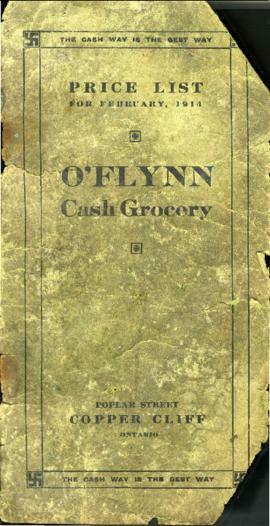 The O'Flynn Cash Grocery Price List was bought at a yard sale by Barry Smith before being donated to the City of Greater Sudbury Archives in 2009. For more information about the O'Flynn Cash Grocery see The Sudbury Star, January 14, 1914, p. 4. For more information on Rose O'Flynn and her husband, Gregory Lee, see The Sudbury Star, December 7, 1910, p. 8; June 2, 1915, p. 4; June 9, 1915, p.4; July 7, 1915, p. 5; June 3, 1950, p. 3 & 6; & December 1, 1969, p. 3.